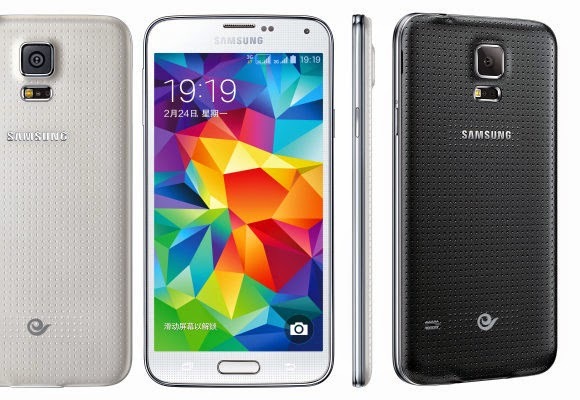 8.1 mm (0.31 in) D.
Samsung Galaxy S5 is an Android smartphone produced by Samsung Electronics. Unveiled on 24 February 2014 at Mobile World Congress in Barcelona,Spain, it was released on 11 April 2014 in 150 countries as the immediate successor to the Galaxy S4. As with the S4, the S5 is an evolution of the prior year's model, placing a particular emphasis on an improved build with a textured rear cover and IP67 certification for dust and water resistance, a more refined user experience, new security features such as a fingerprint reader and private mode, expanded health features (such as a built-in heart rate monitor), and an updated camera. The Galaxy S5 received mostly positive reviews; while praised for the improvements to its design, display, software, and camera, the S5 was criticized for its fingerprint scanner and hardware improvements over its predecessor. 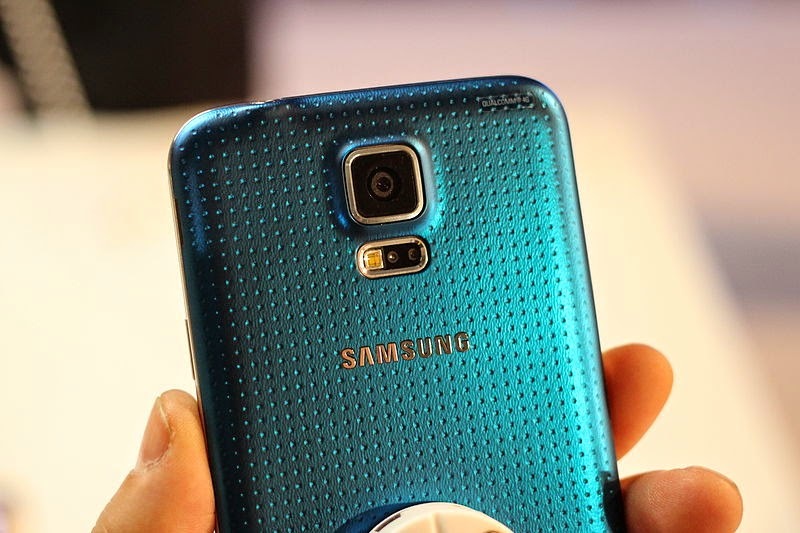 Rear of an "Electric Blue" Galaxy S5, showing the textured rear, camera, and heart rate sensor. The design of the S5 evolves upon the design of the S4. It features a rounded, polycarbonate chassis carrying a "modern glam" look, faux metal trim and a removable rear cover. Unlike past models, the S5's rear cover uses a higher quality soft plastic and is dimpled to improve grip. The S5 is IP67 certified for dust resistance, and for water resistance in up to 1 metre (3.3 ft) of water for up to 30 minutes; as such, the S5's Micro-USB 3.0 port uses a removable cover. The S5 is available in Charcoal Black, Electric Blue, Copper Gold, and Shimmery White color finishes. The S5's screen is a 5.1-inch (130 mm) 1080p Super AMOLED panel, which is slightly larger than that of the S4, and allows for automatic brightness and gamut adjustments. Below the screen are three buttons. The physical "Home" button in the center contains a swipe-based fingerprint reader. The "Recent apps" and "Back" buttons are capacitive. In accordance with Android 4.0 human interface guidelines, the S5 no longer uses a "Menu" key like its predecessors, although its button layout is still reversed in comparison to other Android devices with the S5's button layout (such as the HTC One X and Galaxy Nexus, whose "Back" buttons are to the left of "Home"). The S5 includes a 16 megapixel rear-facing camera, which offers 4K video recording, phase detection autofocus (which can focus in around 0.3 seconds), real-time HDR photos and video, and an image sensor with Samsung's "Isocell" technology, which isolates the individual pixels inside the sensor to improve its ability to capture light. Next to the camera's flash on the rear of the device is a heart rate sensor, which can be used as part of the S Health software. The S5 is powered by a 2.5 GHz quad-core Snapdragon 801 system-on-chip with 2 GB of RAM. Although not mentioned during the keynote presentation, a variant (SM-G900H) with an octa-core Exynos 5422 system-on-chip was also released in multiple markets. Like the previous model, it uses two clusters of four cores; four Cortex-A7 cores at 1.9 GHz, and four Cortex-A15 cores at 1.3 GHz. Depending on resource usage, the SoC can use the power-efficient A7 cores for lighter processing loads, and switch to the A15 cores for more demanding loads. Unlike previous iterations, however, the Exynos 5422 can run both sets of cores at the same time instead of only one at a time. The S5 contains a 2800 mAh battery; its software also contains an "Ultra Power Saving" mode to further extend battery life; when enabled, all non-essential processes are disabled, and the screen switches to only rendering in white on black. Samsung claims that with Ultra Power Saving on, an S5 with 10% charge remaining can last for an additional 24 hours in standby mode. The S5 ships with Android 4.4.2 "KitKat" and Samsung's TouchWiz software. Unlike TouchWiz on the S4, the S5's TouchWiz has been given a more refined interface with a flatter and geometric look, although certain aspects of the changes were influenced by a recent patent licensing deal with Google, which requires that Samsung's TouchWiz interface follow the design of "stock" Android closer. The S5 adds the Galaxy Note 3's "My Magazine" feature to the leftmost page on the home screen, the Settings menu was updated with a new grid-based layout, a Kids' Mode was added, while the S Health app was given expanded functionality, integrating with the new heart rate sensor on the device, along with the new Gear 2 smartwatch and Gear Fit activity tracker. The "Download Booster" tool allows internet usage to be split across LTE and Wi-Fi to improve download speed. Due to carrier policies, Download Booster is not available on most Galaxy S5 models released in the United States, excluding T-Mobile US and U.S. Cellular. The S5 contains a number of new security features. The fingerprint scanner can be used to unlock the phone, while an SDK is available so third-party developers may offer fingerprint-oriented functionality in their apps; for example, PayPal integrated support for the fingerprint sensor to authenticate online purchases. The S5 also adds "Private Mode", which allows users to maintain hidden apps and file folders that cannot be accessed without additional authentication. The camera app was updated with a new "Shot & More" menu that allows users to make edits to photos after they are taken, and also adds a new selective focus mode. Two rugged variants of the Galaxy S5 were released in the United States, the S5 Active (exclusive to AT&T) and S5 Sport (exclusive to Sprint); both models feature a ruggedized version of the S5's design with a full set of physical navigation buttons, and do not include the fingerprint scanner, but are otherwise identical to standard models of the S5. Both devices also include an exclusive "Activity Zone" app, which contains a barometer, compass, and stopwatch. The S5 Active adds an "Active Key" to the side of the device, which can be configured to launch certain apps on short and long presses; by default, the button launches Activity Zone. The Sprint S5 Sport has a modified desi contains additional pre-loaded Sprint Fit Live software, which acts as a hub for health-oriented content and S Health, along with the Under Armour-owned MapMyFitness MVP service and the music streaming service Spotify—the device comes with complimentary subscriptions to both services. Both models come in different color schemes (grey, camouflage green, and red for the S5 Active, and blue and red for the S5 Sport), and the S5 Sport is slightly lighter in weight than the S5 Active, at 158 g (5.6 oz) instead of 171 g (6.0 oz). The S5 received positive to mixed reviews, with many critics arguing that the S5 was simply an "evolution" of the previous model and did not contain enough significant changes for existing S4 owners. Although reviewers noted the slightly better appearance and build quality of the S5 as an improvement over the S4, Samsung was again criticized for not making any significant changes to the design of the device in comparison to previous Galaxy S series models, and for not using metal or a higher quality plastic. The display of the S5 was praised for having a high quality, not being as oversaturated as previous models, and having a wide range of viewing angles, brightness states, and gamut settings to fine tune its appearance. Reviewers also noticed that, despite the high power of its processor, some apps and interface functions suffered from performance issues, indicating that the S5's operating system may not have been completely optimized for its system-on-chip. The S5's interface was praised for having a cleaner appearance than previous iterations—however, it was still criticized for containing too many unnecessary features and settings (an issue compounded by the redesign of its Settings menu). The S5's camera received mostly positive reviews for the improvements to image quality provided by its Isocell image sensor, but was deemed to still be not as good as its competitors, particularly in the case of low-light images. While the S5's camera interface was praised for having a streamlined design, it was criticized for taking too long to load, and the Selective Focus features were panned for being inconsistent in quality. While praised for providing more uses than the Touch ID function on the iPhone 5s, the fingerprint sensor was panned for requiring an unnatural vertical swiping gesture, having inconsistent and unforgiving results, and for being inconvenient in comparison to a password or PIN in most use cases due to these shortcomings. The Berlin-based Security Research Labs found that because the S5's fingerprint sensor could easily be spoofed, allows unlimited chances, does not automatically require a PIN after 48 hours of inactivity or on startup, and can be used for more than just unlocking the phone, it "gives a would-be attacked [sic] an even greater incentive to learn the simple skill of spoofing fingerprints." Engadget considered the heart rate sensor to be similarly unforgiving and sometimes being inaccurate in comparison to other heart rate trackers, while The Verge felt that it was a redundant addition due to the concurrent introduction of the Samsung Gear Fit, which also includes a heart rate tracker. The S5 shipped to retailers 10 million units in 25 days, making it the fastest selling smartphone in Samsung's history. Samsung shipped 11 million units of the S5 during its first month of availability, exceeding sales of the S4 in the same period by 1 million units. Despite the sales of the S5, in July 2014, Samsung reported its lowest profits in over two years, and a drop in market share from 32.3% to 25.2% over the past year. The loss in market share was attributed primarily to growing competition from competitors—especially in the growing low-end smartphone market, and an already saturated market for high-end smartphones. Last updated on 15 October 2014 at 01:29.